So, today was my aunt Shawna's baby shower. It took place at my grandparents' house in Boulder City just outside of Las Vegas (it's on your way to Hoover Dam.) Thankfully, this time I remembered my camera and wasn't cooking. Got tons of great shots of the kids. 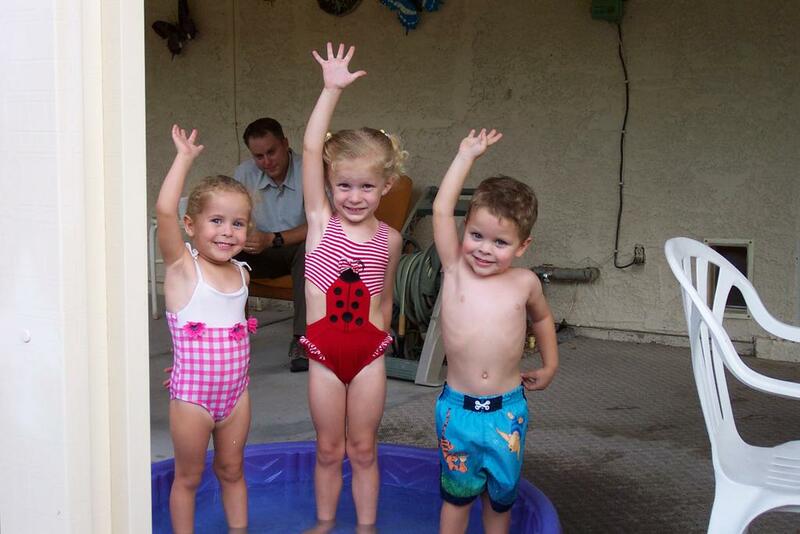 In the first picture you'll see here are (left to right) Olivia, their cousin (Shawna's daughter) Sydney and Connor. Behind them is the twin's father Cory. I didn't expect the hands in the air but that's what I get for asking them to look my way and look at my hand. So they decided to copy what I was doing. They should be fast asleep right now as we wore them out. Connor got accosted by a yellow rose bush and will probably avoid plants with thorns. Olivia spent a lot of time trying to sneak candy and put it aside for later. She has her mom's sweet tooth. 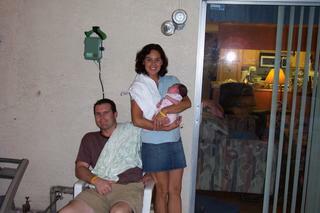 Here we have my brother Matt, his wife Elizabeth and newest Hennessy... Mia. She wound up getting quite a few new toys tonight but I'm sure that she'll have a room full before she ever starts playing with them. I know that my mother would have loved to spend time with her new grandchild and play with the other kids but she is recovering from her second neck surgery (and hopefully last for at least a year.) She did have me stop by and pick up some ham and baked beans from her. I was really impressed with how the kids varied what they ate and went after the strawberries, grapes and even celery with gusto. Ok, I need to pass out now. But had to make sure I got some of these pictures up. Got a few of them kicking a soccer ball and one of Connor in a little toy car. I gave each of them a ride on it as I pushed them across the bumpy grass (of course I told them to raise their legs because I didn't want any mishaps.) Had quite a nice time. Oh... also updated Grandpa's computer (had some spyware on it but then again you have to expect that when it hasn't been updated in 320 days) which should run a lot smoother. Those are some great shots Martin. The first one is cracking me up. It sounds like a great time. Thanks for the pictures - sounds like a graeat time. LOL about the spyware. Whenever I go to Dad's house, I have to spend an hour tuning it up for him. I hear ya about the tune-ups. Unfortunately, my Mom uses my computer, so I have to fix it everytime I get on it, lol. Amateurs. Martin they are adorable! Glad you had such a great time with the family. aw...such a cute bunch of kids...all of ours are grown up in my immediate family, at least they are teenagers or young adults, those aren't as cute for some reason..ya know what i mean, they whine about things in life and demand stuff, expensive stuff..anyways..it was cute seeing your little ones.. Cute pic. Reminds me of when me and my brothers were small like that with the little pool in the yard. It was all the better if it had a little slide on it.